Biological collections held in natural history museums are important scientific infrastructures, supporting biodiversity research in many areas, preserving resources generated by scientific research, supporting educational and artistic activities. 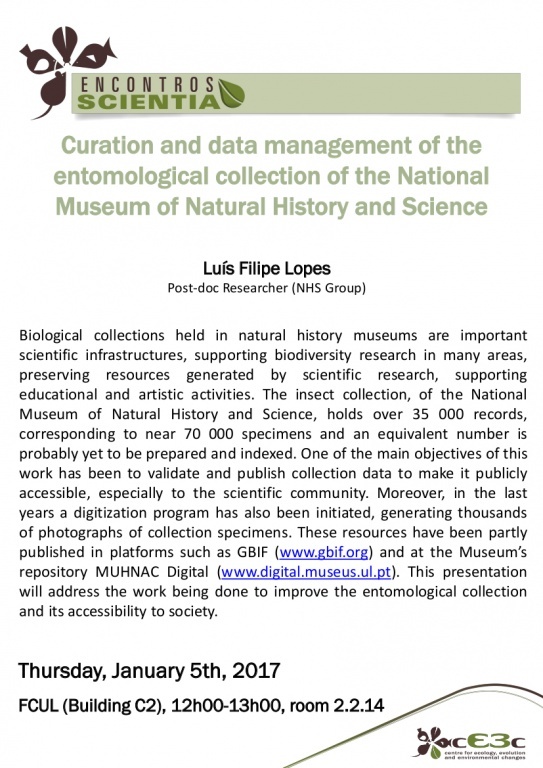 The insect collection, of the National Museum of Natural History and Science, holds over 35 000 records, corresponding to near 70 000 specimens and an equivalent number is probably yet to be prepared and indexed. One of the main objectives of this work has been to validate and publish collection data to make it publicly accessible, especially to the scientific community. Moreover, in the last years a digitization program has also been initiated, generating thousands of photographs of collection specimens. These resources have been partly published in platforms such as GBIF (www.gbif.org) and at the Museum’s repository MUHNAC Digital (www.digital.museus.ul.pt). This presentation will address the work being done to improve the entomological collection and its accessibility to society.